Get on top of it fast to get it sorted today! Have you ever come home from a holiday or a long day at work only to discover that your fridge is warm and making a strange humming sound? It is truly frustrating and stressful. Here at Albion Appliances, we offer onsite and mobile services to help you fix any problem you may have with your fridge or freezer. Call us now on 07 3630 1611 to book your appointment and ensure your fridge or freezer is fixed today! Is your fridge experiencing any of the following problems? • The door seal is broken. If yes, you should definitely give us a call today on 07 3630 1611 so we can fix the problem for you as quickly as possible. Most of these problems are simple fixes that we can do on the spot. 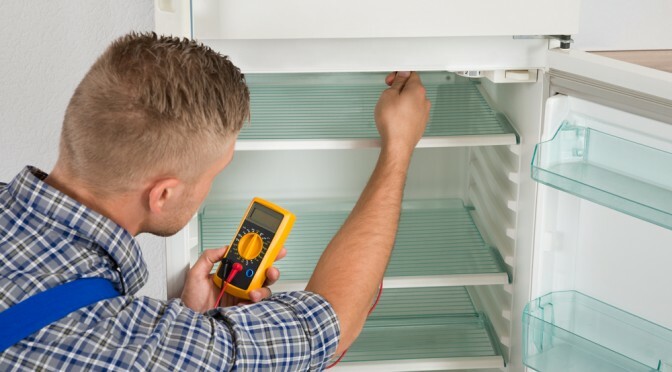 Usually, repair jobs can take from 30 to 50 minutes depending on the type of repair needed, and over 99% of our fridge repair service calls are first call fixes. There are however a few reasons why it may not be possible for your fridge to be fully repaired on the day of your appointment. While we usually carry most functional parts with us in the service vans, sometimes the parts required will need to be ordered. This could be due to a rare issue with your fridge, or because your fridge might be an older model than most. Also, it may be a particularly busy time of the year, where many people are experiencing power outages in summer or fridges are having to work harder in the heat. One of the most common reasons though is door seal issues. Door seals aren’t carried in our service vans when calls are made. The seals are made out of a material embedded with a magnetic strip that has to be laid flat. This makes it impractical to store within the service vans. There are also over 90 different types of door seal, and it would be impossible to carry every single type of seal with us. We do take orders and seals are normally fitted within 1 to 7 working days, depending on the model. We try to make your wait as short as possible to minimise the inconvenience. Call Albion Appliances on (07) 3630 1611 now to avoid missing out on an appointment today!